Why to take regular breaks? Staring at a computer monitor for hours on end has become a part of the modern workday. And inevitably, all of that staring can put a real strain on your eyes. The name for eye problems caused by computer use is Computer vision syndrome (CVS). CVS is not one specific eye problem. Instead, the term encompasses a whole range of eye strain and pain experienced by computer users. In addition, working adults aren’t the only ones vulnerable to computer vision syndrome. Kids who stare at portable video games or tablets or who use computers throughout the day at school also can experience eye problems related to computer use, especially if the lighting and computer position are less than ideal. How Can the Computer Screen Affect Vision? Computer vision syndrome is similar to carpal tunnel syndrome and other repetitive stress injuries at work. It occurs when you’re carrying out the same motion over and over again. Just like those other repetitive stress injuries, computer vision syndrome can get worse the longer you continue the activity. Working at a computer requires that the eyes continuously focus, move back and forth, and align with what you are seeing. You may have to look down at papers and then back up to type, and the eyes have to accommodate to changing images on the screen in order to create a clear picture for the brain to interpret. All of these functions require a lot of effort from eye muscles. Working on a computer is more challenging to your eyes than reading a book or piece of paper, because a computer screen also adds the elements of screen contrast, flicker, and glare. Computer eye problems are more likely to occur if you already have an eye problem(such as nearsightedness or astigmatism) or if you need glasses but don’t wear them or wear the wrong prescription for computer use. Working at a computer gets even more difficult as you get older. That’s because the lens of your eye becomes less flexible. The ability to focus on near and far objects starts to diminish after about age 40 – a condition called presbyopia. What Symptoms Are Part of Computer Vision Syndrome? There’s no evidence that computer vision syndrome causes any long-term damage to the eyes. However, regular computer use can be the source of significant eye strain and discomfort. If these symptoms are not treated, they can have a real effect on your work performance. Repetitive stress injury (RSI) and eye strain are common ailments among computer users, and there’s no silver bullet for avoiding them beyond taking regular breaks to relax. There is a really popular rule among ophthalmologist and doctors called 20-20-20 rule. The 20-20-20 rule suggest that after every 20 minutes, you (the computer user) should take a break for at least 20 seconds and look at objects that are 20 feet away from you. So give your eyes a break. Look away from the screen every 20 minutes or so and either gaze out the window or scan the room for about 20 seconds to rest your eyes. Blink often to keep the eyes moist. How Iris reminds you to take a breaks? Finally we get to the point. 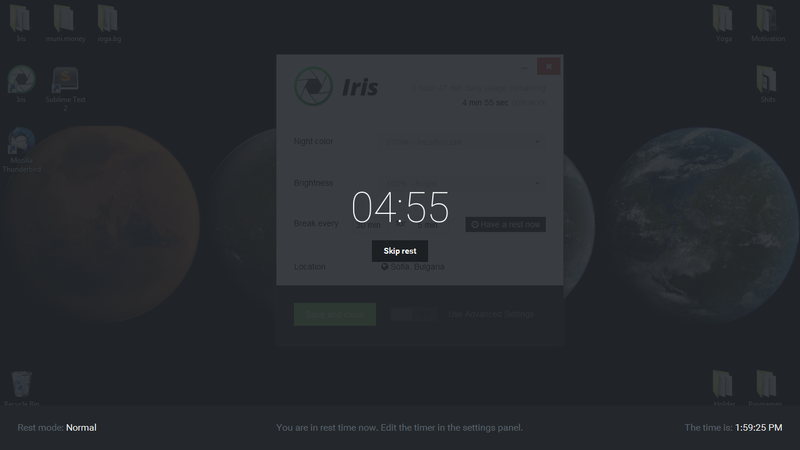 How exactly Iris can help you? 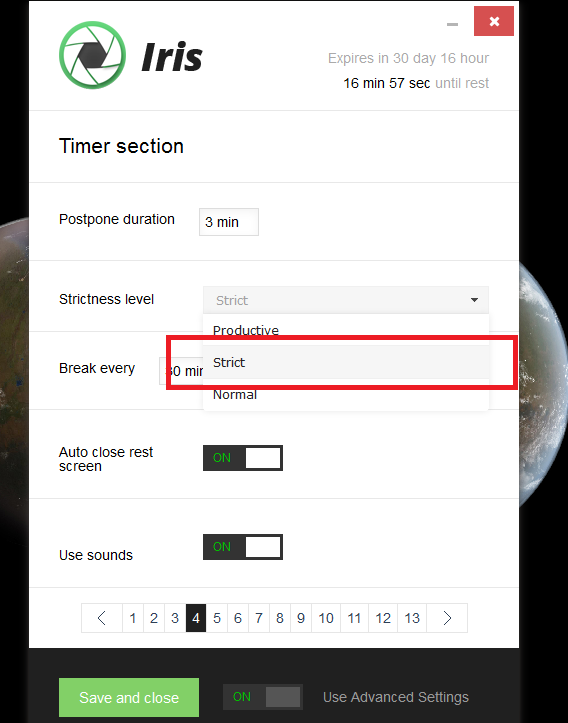 You can change work and rest time duration from the Simple view. Save the new settings with Save and close and test the new settings with Have a rest now. WARNING! : There is no way to skip Strict mode. Only restart will work. The Strict mode is disabled by default, because well it’s really Strict. Your keyboard is disabled and the only way to skip this window is to restart the system. We will show you how. To activate Strict mode go to advanced settings. 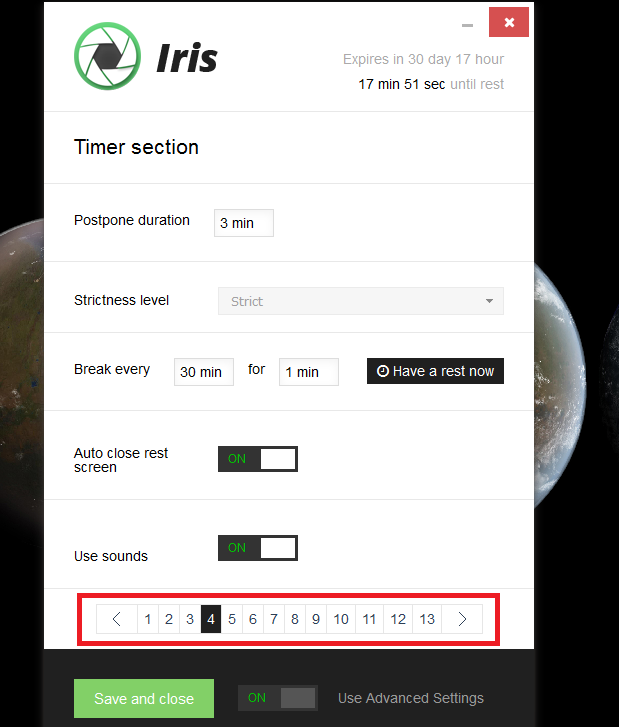 Select Timer section page and from the Strictness level menu choose Strict. 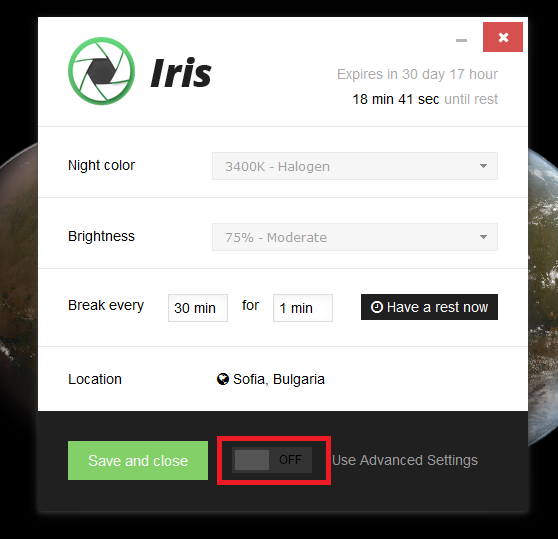 After you click Save and close you can test the Strict mode with Have a rest now button. How can I skip it? We are sorry to disappoint you, but there is no way. This is why this is called strict mode. If you don’t have the will to stand up just don’t use it. Use Normal mode instead. How to restart the computer? In Strict mode almost all key combinations are disabled, but you can still useCtrl+Alt+Del on Windows. And from this window select the Big red button and choose Restart. Productive mode is for people who have high willpower and are masters of their time. 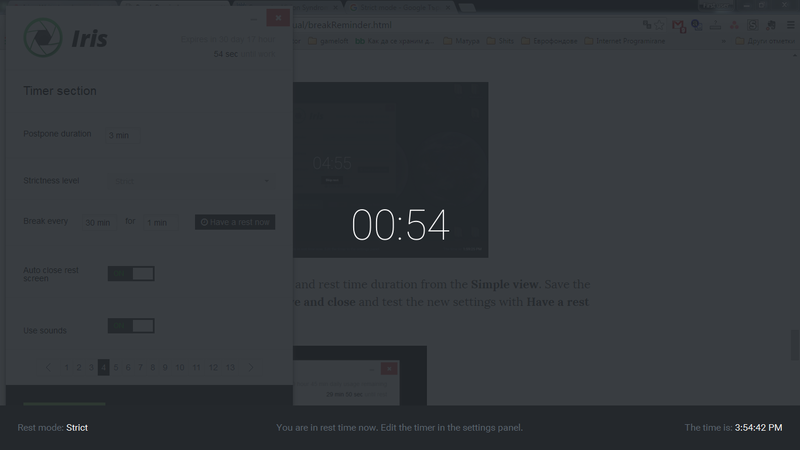 It’s small window with a timer in it on top of everything. You cantrack time with it, manage rest and work and well if you are the type of person who will use this you have a lot of creativity. You will find your way to use it. 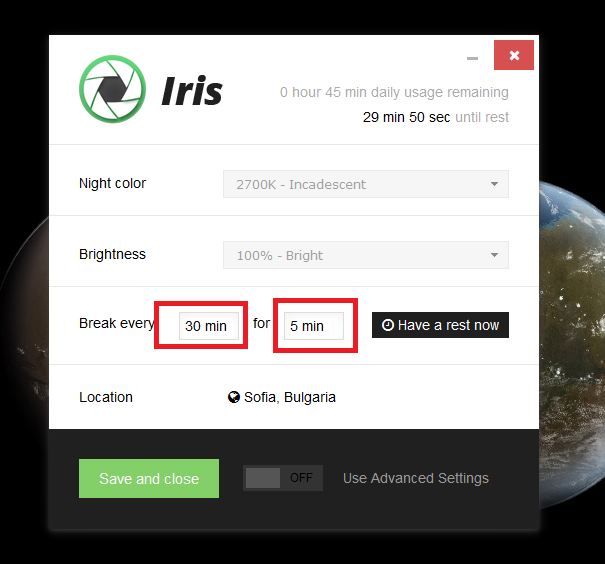 I just began using Iris today and I appreciate Iris’s goals of saving our eyes! I like the rest periods since we all get so wrapped up in what we’re doing that we rarely stop to breathe, much less blink or look away.